Automobiles have changed a lot since their invention during the turn of the century. From your standard, run of the mill Model T Car to the Luxury Vehicles which now line the streets, as their body styles have become more elaborate, so have the paint jobs. And with an estimated billion cars on the road today, the likelihood of having some sort of fender bender in your lifetime is high. Bringing the world quality automotive paint is a cinch thanks to a custom eBay Store Design courtesy of OC Designs Online. See for yourself! 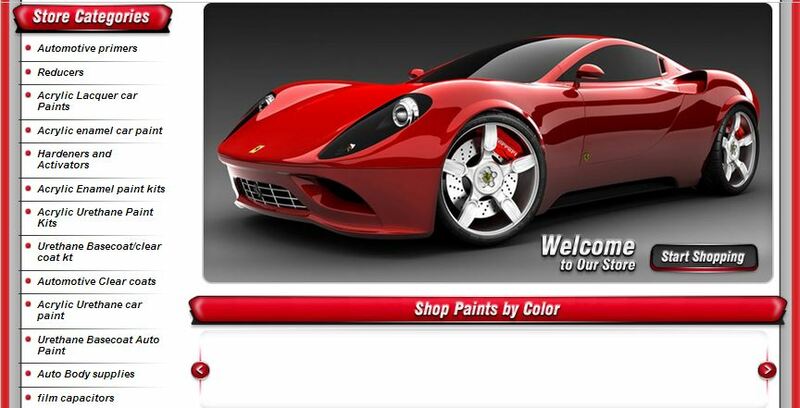 Since 1998 Paint for Cars has provided automotive paint and supplies to shops and customers alike. Now, with a custom eBay Store Design they have expanded their reach and put a very professional foot forward. The crafty logo pops against the red hood of a muscle car and offers shoppers a way to target supplies with a custom search bar. By entering keywords or phrases here, customers can make their purchases and ride off in a flash. In the main navigation bar below, explore paints, company policies, feedback, and contact information before continuing on to the paints below. Under an expansive vertical listing of 15 store categories, buyers can easily traverse the many varied types of painted offered by Paint for Cars. Or, for those who prefer to shop by color, a scroll of them appear just below the eBay Template’s welcome message, which draws you in with a polished sports vehicle and invites you to ‘start shopping’. In the midsection, a four panel spread of featured products are both interchangeable for the site manager and enticing to the customer. The left sidebar of this stylish eBay Template Design boasts the store’s promise of fast shipping via Fed Ex, a multitude of payment options, and outstanding customer support. The left sidebar closes with an invitation for car enthusiasts to sign up for the newsletter and keep abreast of new items and special promotions. As is customary with our eBay Shop Designs we utilized a custom footer to wrap up the storefront. Here, shoppers are met again with important company information via a mini sitemap and the Paint for Cars logo to reinforce branding recognition. Are you looking to gain an edge with a stunning and noticeable eBay Store Design? Let us show you how! Browse our portfolio and then request a free quote. Let’s be social! We cordially invite you to follow us on Facebook and Twitter. For Pinspiration, wander over to our Pinterest boards and take a peek.